In my studies I have come across many accounts of the Serpent. I will assume familiarity with the Judeo-Christian beliefs on the part of my readers and concentrate on the more exotic tales. My most recent readings in this area are The Divine Serpent In Myth And Legend by Dr. Robert T. Mason, Ph.D., D.D. and The One that got Away by Thorskegga Thorn. 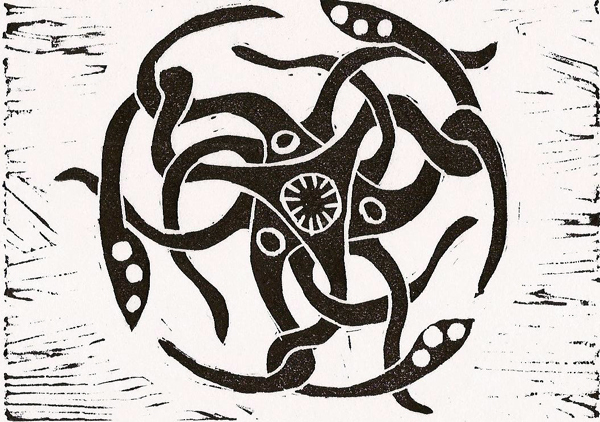 Carl Jung, student of Krafft-Ebing and colleague of Sigmund Freud, frequently referred to the symbol of the Ouroboros—the serpent swallowing its own tail in a continuous cycle of destruction and creation. This autophagic serpent was first seen as early as 1600 years BC in Egypt. It traveled via the Phoenicians to the Greeks, who named it Ouroboros. Many cultures believed that this globe-encircling serpent was responsible for earthquakes and tidal waves that damaged fishing fleets. Jung believed that the serpent was an archetype, to be found in every culture. We begin with the divine serpents of Voodoo. These gods are morally neutral, but will work for good or evil depending upon who calls on them. Strongest is Simbu, the Serpent God of Darkness, but more widespread in belief is the Serpent Dambala, known to the Haitians as Le Bon Dieu. He is married to the Rainbow Snake, Aida-edo (the rainbow was associated by the Norse with the Northern Lights and the bridge to Asgard, as previously discussed). The aboriginal Kabi people of Queensland, Australia also worship a rainbow serpent, known as Dhakhan, who leads them to watering holes. In the Caribbean Islands, we find El Cuchilu (Cuchu-vilu, or Pig-Snake) an evil god of the sea who destroys fishing weirs, devouring the fish and killing any fishermen he can catch. Could Cthulhu be the origin for this name? Japanese Shintoism also has a major evil Serpent God, Susa-No-Wo. In the chief drama of Japanese mythology, Susa-No-Wo insulted the sun goddess Amataratsu-omi-kami and caused her to hide in a cave until the crops failed and famine set in. In an interesting variation of crucifixion and resurrection, all the other Gods except Susa-No-wo lured her out and tied her to a tree so that she could not again deprive the world of light. The cultural importance of this story can be seen in that the Kanji characters for Japan are the Sun (Amataratsu Omi Kami) and the Tree. For his mischief, Susa-No-Wo was banished from Japan and became a non-persona in Shinto. It is possible that all serpents of myth were derived from the Sumerian snake god, Zu, the lord of the watery abyss from which mortal life arises and to which it returns. Among the Celts the underworld serpent, Sucellos, represented the same dark power. Just as the Vikings believed that Yggdrasil, the tree of life, is both guarded and gnawed by the serpent Nidhogg, (often associated with Jormungand), early Sumerian and Akkadian artifacts show pictures of a tree called the “axis mundi “, or the world axis, guarded by a giant snake. This also brings to mind the Serpent in the Garden, coiled in the Tree of the Knowledge of Good and Evil. The Norse fishing myth of Thor and Jormungand is frequently compared to the Hindu tradition of Indra and Vritra. The great Serpent Vritra blocked the major rivers, bringing famine to man. The God Indra attacks the Serpent with his lightning bolt, sundering its belly and releasing the waters. This battle takes place annually. Idra and Thor may both have their origins in a common Indo-European myth. This entry was posted on Sunday, May 27th, 2007 at 8:34 pm and is filed under Cthulhuvida. You can follow any responses to this entry through the RSS 2.0 feed. Responses are currently closed, but you can trackback from your own site.